The team from UQ's Institute for Molecular Bioscience has created a synthetic form of the hormone which is less likely to have side effects. UQ researcher Dr Markus Muttenthaler said the hormone regulated labour and fundamental social behaviours such as maternal care, partnership bonding, social interactions and stress and anxiety responses. "The downside to oxytocin is that it activates a number of receptors, some of which can lead to unwanted side effects," Dr Muttenthaler said. "For example, oxytocin is used to progress labour but it can have serious side effects such as cardiovascular problems or uterine rupture when used for too long or at a too-high dose." "The new compound we have developed is just as potent as oxytocin, but shows improved selectivity for the oxytocin receptor, potentially reducing dangerous side effects. "It didn't activate heart muscle cells, and produced a more regular contraction pattern in uterine tissue, which indicates improved safety for mother and baby." The team created a new molecule by introducing small modifications to the structure of oxytocin, which reduced the activity of receptors linked to some side effects. 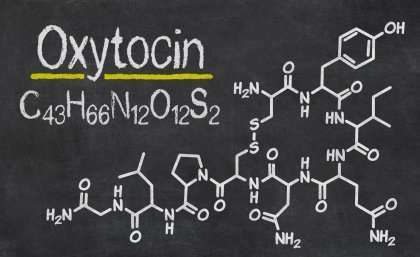 Oxytocin is being investigated as a treatment for a variety of high-profile conditions such as autism, migraine, schizophrenia, anxiety and stress. The researchers also tested the new compound in a mouse model and found those treated with the new compound overcame social fear rapidly, highlighting its therapeutic potential to treat social phobia and anxiety, or autism. "The new compound is not only a promising lead for future treatments but also important for understanding the role of the oxytocin receptor in health and disease," Dr Muttenthaler said. "We're hoping to secure funding to improve the drug properties of this lead and carry out more extensive preclinical studies." The research was published in the international scientific journal Science Signaling.